India’s water crisis is rooted in poverty and inequality, not in physical availability, and this is more apparent in the fluoride hotspots of Tamil Nadu. Forty-eight-year-old P Selvaraj, a farmer at Seerikaddu in Kuppanur Panchayat (Ayothipattinam block of Salem District) has a severe case of dental fluorosis, with his entire set of teeth stained brown. Recollecting working as a volunteer who carried out an awareness campaign about fluorosis under the Swiss based International Voluntary Mission as early as 1984, when fluoride contamination was not even known in most parts of the country, he says that not much has changed for the people in his area over the years. “My own house and hamlet are still not connected to even the borewell water network, leave alone the Cauvery river water. Over the decades, scores of people in the village have got skeletal fluorosis and non-skeletal fluorosis,” he laments. Selvaraj’s younger brother, Ayanthurai (45), also a dental fluorosis victim, says he avoids eating at houses of friends or relatives if he has to squat on the floor because of his inability to fold his legs. His joint pain and numbness are symptoms of onset of non-skeletal fluorosis. People with permanent hunch back (caused by calcination of bones) is common in the area. It is also common to spot mini vans loaded with canned water criss-crossing the villages. As awareness levels have increased, people spend money to buy water to drink and use bore well water for cooking. But not all can afford this, says Ayanthurai, alleging that the private water sellers were the prime vested interests behind non-supply of Cauvery water. People’s allegations of low supply of Cauvery water are supported by panchayat clerks of Kuppanur and Achangukuttapatti. They say that Cauvery water from the Combined Water Supply Scheme (CWSS) is supplied twice a month, and mostly Cauvery water is mixed with groundwater pumped to the village tank. These panchayats also have under them entire villages and wards where there is not even one overhead water tank. Seerikaddu is a cluster of tiny habitations like Gandhi Kasthuripuram and AD Colony where nearly 1,500 people live. Fluoride-contaminated groundwater is the only source of drinking water and the same is used for cooking too. Fluoride content in the water consumed, ranges between 1.4 to 2.2 ml/l. Thanks to a non-river source mini scheme, groundwater from a well with less fluoride in Mookanur village is pumped to nearby habitations. This supplements the shortfall in CWSS supply in some hamlets, but even this water does not reach Seerikadu. About five kilometers further up is Sengattur, where even schools don’t have good water. The Reverse Osmosis unit is defunct and the teacher claimed she provided boiled water to the children. In the village, there are 10 public taps installed purportedly to serve CWSS water (one tap each for 20 families, fulfilling the Central government norms). “These taps are mere showpieces,” says a villager. “Cauvery water is supplied once in a month and sometimes once in three months,” says another. There are no house-to-house connections to the CWSS network and people depend on canned water for drinking. Bore well water is pumped into the overhead tank water which is used for cooking and washing, and when tanks go empty. There are also a few handpumps which women laboriously pump, as erratic power supply scuttles the bore well functioning. The fluoride content in Sengattur’s groundwater ranges from 2 to 4 ml/l. At times, when the people cannot afford to buy canned water, they resort to the groundwater sources for drinking to washing purposes. The demand-side interventions too have failed to work. In AD Colony of Achangukuttapatti panchayat, a water purification system installed at a cost of Rs 15 lakhs in the year 2014 with Rajya Sabha MP Kanimozhi’s constituency fund lies in a state of disuse, it has no power connection. The village of 350 families has several dental and skeletal fluorosis cases. “We don’t know when it will come, so we don’t expect it anyway,” says Subramani, who has lost all his teeth to prolonged fluoride ingestion. Women of the village say the water purifier worked only for one day and each household was allowed to take five pots of water. Officials say they are unaware of the issue. 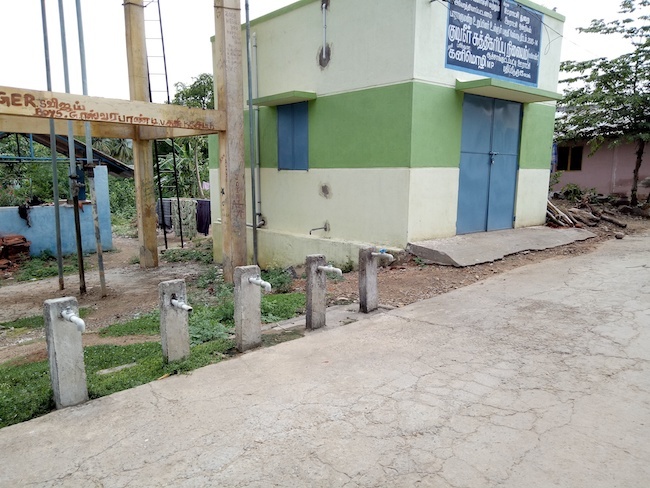 As we go further up to Avarankattur in Papireddypatti Taluk of Dharmapuri district, we find a modern drinking water processing plant in a defunct state. Villagers say that it was a private initiative to provide clean water to the people of the area which did not take off and remains closed for about 10 years. There is no sight of the community water purifiers announced in the Parliament recently, for which funds were also allocated. At Elanthakottai, a village under the Pattukonampatti panchayat, a group of elderly men are whiling away their time under the shade of a huge tamarind tree. 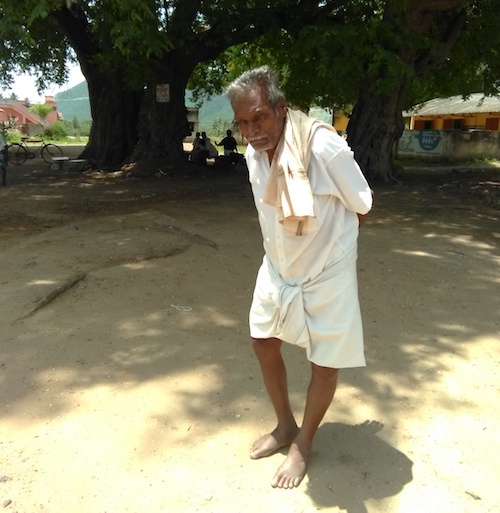 “We still have some productive years left, but we are shunned by employers because of our poor health,” says Varadhan, the eldest of them all, whose back is permanently hunched and both the legs bowed out. All these men are in various stages of bone and non-skeletal fluorosis. Fluoride victim Varadhan of Elanthakottai in Dharmapuri district moves with a permanent hunch and spondylitis. The government tribal residential school in the village once had the maximum number of children with stained teeth and served as material for the Information Education and Communication (IEC) posters that were prepared for the awareness drives between 2012 to 2016 under the Hogenakkal Water Supply and Fluorosis Mitigation Project. J Sekar, the Headmaster of the School, claims that the number of new infections among the children has considerably reduced in the last few years, but the school still has no direct supply of Cauvery water from the Hogenakkal Water Supply Scheme. The bore well in the village is the main source of supply, while the occasional supply of Cauvery water is mixed with the salty groundwater and distributed to the village tanks. Ayothiyapattinam Block Development Officer (BDO) YS Kumaresan says there is no truth in what people say and that in a month, there could have been one or two occasional halts in pumping due to technical problems. The stock answer one gets from the Tamil Nadu Water Supply and Drainage Board (TWADB) officials is that the district is 100% under coverage of CWSS with Cauvery as the source, hence there was no question of villages being deprived of protected water. In Tamil Nadu, TWADB is concerned with only filling the overhead tanks of the local bodies at the Town Panchayat and Panchayat Union levels. It is the duty of the local bodies to distribute it equitably and efficiently. In the case of Panchayat Unions, there is yet another layer of power through which water is regulated. The Village Panchayat holds the role of distributing water to its inhabitants and it is here we see the local power play of the elected president, who could deprive wards or hamlets which did not vote in his favour. Adding to this are allegations of illicit pilferages and frequent breakdowns and leaks in the main feeder lines. On June 17, 2018, during the Grama Sabha meeting in Kupanur panchayat, people questioned the Rs 3 lakh bill paid by the Panchayat to the Union as electricity charge, when the pumping activity was disproportionately low. The Papireddypatti Block Development Officer could not deny facts and admitted that mixing of Hogenakkal water with local bore well water was inevitable during times of fewer yields from pumping. When the reporter visited the village, water supply was hit for two weeks because the fresh Cauvery water released from Kabini dam was very muddy and the head processing plants in Hogenakkal could not handle it, despite the fact that two months ago the Dharmapuri Collector instructed the TWAD Board officials, local body commissioners and BDOs to ensure that Cauvery water is supplied separately and should not be mixed with groundwater. Under the Hogenakkal Project, a separate 5,000 litre tank has been constructed in every village but they too remain as showpieces. At the headquarters of the TWAD Board’s Fluoride Mitigation Circle – a swanky looking office in Dharmapuri which handles the Hogenakkal Water Supply and Fluorosis Mitigation Project – the Superintending Engineer (In-charge) S Marudhamuthu laughs away the whole issue. “You can’t satisfy the public. Even if you provide more than their daily needs, they would say it was not enough. Wastage, misuse, overdrawing, use for other than drinking and cooking are issues best prevented by individual civic consciousness,” he says. At Salem, the Executive Engineer TWAD Board Rural Water Supply (Superintending Engineer In charge) P Rajenderan, claimed that he was able to achieve a supply of nearly 55 litres per head per day on an average, but added a rider that it was an average figure and the supply could vary depending on place and time. There is poor data at the local level, and NITI Aayog’s CWI report too mentions about the poor quality of water data. Further, according to insiders in the department, the Salem District, Village Panchayats have to clear arrears totalling to Rs 36 crore to TWAD. A one-time settlement with waiver of penalties is being negotiated. In several other districts, the rural and urban local bodies sit over a huge pile of uncleared bills. At the Primary Health Centre (PHC) in Kallipettai in Papireddipatty Taluk, the Medical Officer C Jayaraman, says that the new cases of fluorosis have come down by 50%. While there is no treatment for any type of fluorosis, only preventive measures can help mitigate the problem. The existing chronic cases were given folic acid, iron and calcium tablets, he says. According to Dr Socrates, former Deputy Director Health Services who worked in the Fluoride Mitigation Project after retirement, acute cases of bone and non-skeletal fluorosis were recommended regular supply of micro-nutrients through the Primary Health Centres regularly. Young men and women were given cosmetic treatment (which is but a temporary measure only), but most of them dropped out from continuing the course of treatment. The Fluoride Mitigation Component of the Hogenakkal Project involved an elaborate questionnaire-based feedback from fluoride victims after the awareness campaign was carried out. According to P Selvaraj of AWARD, out of the 26,000 persons surveyed in Papireddipatti Taluk for fluoride ingestion, 2,230 had fluoride levels in serum and urine between 2.4 to 5 ml/litre. Severe cases were identified and referred to Government Hospitals for treatment and to the District Rehabilitation Department for social security aid and mobility equipment. Eleven of the severe bone and joint affected persons died as they did not opt for reconstructive surgery. As many as 45 persons died. As on date, the compulsory distribution of nutrition support has now stopped and is given only to those who come to the Primary Health Centre to avail it. There is no ongoing monitoring of the victims and follow-up visits to track their progress. The people who have already been struck by onset of bone degeneration can only hope to manage it by regular intake of healthy green vegetables and micro-nutrient tablet supplements like vitamin C, D3, calcium and antioxidants. “Unless the people are given assured supply of safe water for next 20 years, the children of today will meet the fate of the elders in the village, becoming unproductive at an early age,” says Dr Socrates. He also opined that all fluoride rich bore wells and open wells must be red-marked to caution people against using it. This is Part 2 in a series. Read Part 1 and 3 of the series here.